There are a lot of towns in Indiana that produce Civil War Store Cards with the majority being produced in Indianapolis. 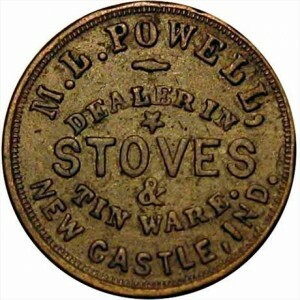 Although some are scarce, these tokens are readily collectible. Due to the proximity to Chicago, Illinois and Columbus, Ohio, there are samples produced by a number of engravers. The majority of those from Indiana are ascribed to the workshop of W.K. Lanphear.